7 April 2017, Ouidah, Benin: Benin is experiencing significant climate change impacts in the agriculture and forestry sectors, which are expected to be compounded by a potential rise in temperature and rainfall, as well as rising sea level, in this coastal least developed nation in west Africa. In Benin, the incidence of flooding, drought, coastal erosion and strong winds are projected to increase. The northern part of the country and its coastal areas – where population density is higher - are considered the most vulnerable to the impacts of climate change. To spearhead the climate change adaptation planning initiative in Benin, the Government of Benin requested support from UNDP for the process to implement the climate change National Adaptation Plan (NAP). An inaugural workshop with the aim to advance the NAP process for government ministerial representatives, was held in Benin from 4-7 April 2017. Speaking of the workshop, Euloge Lima, Ministry of Environment and Sustainable Development of Benin, said “We have familiarised ourselves with the NAP process, adapted it to the Benin context and considered ways in which adaptation options can be prioritised. We are working to enable the NAP process to become a reality in Benin, to enable climate change to truly be integrated in development policies and strategies at national, sectoral and local level." Representatives of the Ministry of the Environment and Sustainable Development, Ministry of Planning, Ministry of Economy and Finance, relevant sectoral ministries – agriculture, health, infrastructure and transport, energy, water and mines, decentralisation and local governance -, representatives of civil society, and academia, were in attendance. The workshop was organised by GIZ and the Ministry of the Environment and Sustainable Development of Benin, supported by the German Federal Ministry for the Environment, Nature Conservation, Building and Nuclear Safety (BMUB), with contributions from the joint UN Development Programme / UN Environment National Adaptation Plan Global Support Programme (NAP-GSP). Access to climate information and integrating climate change into national plans and strategies were key components of the NAP discussions over the four-day stakeholders’ engagement meeting. 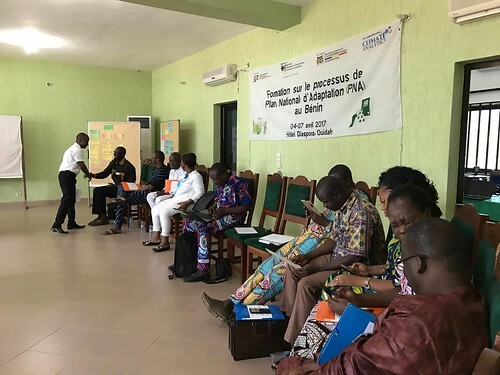 Challenges to climate change adaptation planning in Benin - which include adaptation financing, access to scientific data, and the identification and prioritization of local interventions to reduce climate-related vulnerabilities - were considered. Through the exchange, several key solutions were identified – including the development of a budget line for climate change adaptation, the establishment of sectoral climate change focal points, as well as the integration of adaptation into the National Development Plan. Other important objectives to be addressed through the NAP process were discussed and included the integration of adaptation in local development plans, and the importance of the involvement and participation of local communities in the planning process. Climate change has already been integrated cross-sectorally into the national budget – with a climate change law under development which stipulates that 1% of each ministerial budget be dedicated to adaptation. Building on this initiative to strengthen institutions and coordination for adaptation planning at national level, recommendations were made to enhance government capacities in climate change impact assessment and in M&E of adaptation. Innovative approaches to develop the engagement of the private sector, particularly through Public-Private Partnerships for data collection, especially using telecommunications for gathering meteorological data, and enhancing capacity and research on adaptation technologies were also discussed and will be the focus of the implementation of the various NAP-related initiatives in the country. The next step will be to consolidate the draft roadmap for initiating the NAP process in Benin, and advance the implementation process, supported by GIZ and UNDP.